Google’s Android One initiative got a reboot in 2017, as Xiaomi became the first mainstream OEM to collaborate with the Mountain View guys. Mi A1 got mostly positive reviews and the endeavour to get Google’s version of Android with mid-range phones got revitalized. Xiaomi released two separate models in 2018 under the same series, namely Mi A2 and Mi A2 Lite. 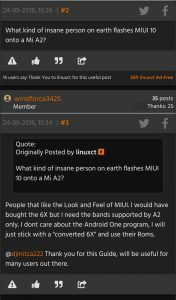 In one of our previous articles, we have mentioned that these Android One phones are directly based on Xiaomi’s existing phones running MIUI. Just a quick reminder, the current lineup is something like this: Mi A1/Mi 5X, Mi A2/Mi 6X, Mi A2 Lite/Redmi 6 Pro – where the later models are running MIUI skinned Android. On the other hand, the MIUI variants come with a custom bootloader implementation by Xiaomi. Though it is also unlockable, the procedure tightly integrates itself with their ecosystem. They also feature a somewhat cryptic anti-rollback/ARB protection which makes it harder to downgrade or cross region flashing. Another major difference between the models is partitioning scheme. Android One models sport newer A/B layout for seamless updates which is absent in the MIUI models. Users across the globe often import Xiaomi phones as official resellers don’t exist in their locality. Some prefer stock Android’s fluidity and rapid updates but can only buy the equivalent MIUI model. For some, getting the Android One model is handy but they adore the look and feel of MIUI. To exploit these kind of demands, several sellers started to ship ‘frankenbuild’ phones. 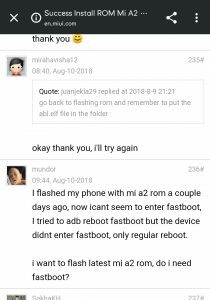 Users were duped as the Mi A1 they are holding is actually Mi 5X running hacked version of Mi A1’s firmware. As the partition tables are not modified, these frankenbuilds are getting bricked after OTA update. The reported incidents on public forums often lack of proper information, but community efforts do exist for helping affected users. Xiaomi opened a can of worms with the introduction of ARB. 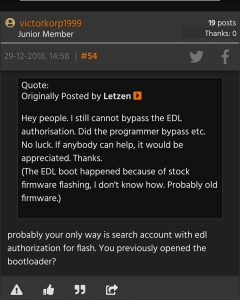 Their engineers also blocked the emergency download (EDL) mode feature of Qualcomm chipsets and associate it with a Mi account verification method. While one can still force booting to EDL mode by disassembling the phone and shorting the test points, ARB makes it absolutely knotty to cross flash the firmwares with frankenbuild components. 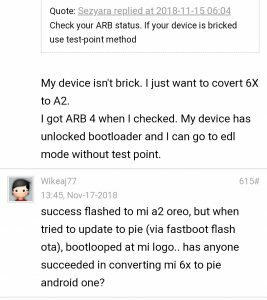 Official and unofficial forums are stacked up with reports of bricked phones due to improper conversion. Sellers from eBay, Alibaba, GearBest and countless other online portals continue to sell such phones to innocent buyers who get absolutely no support after bricking. We at PiunikaWeb will come up with an extension of this article after a while. The conversion methods will be more elaborately discussed and we will also share possible workarounds to unbrick the phones. PiunikaWeb is a unique initiative that mainly focuses on investigative journalism. This means we do a lot of hard work to come up with news stories that are either ‘exclusive,’ ‘breaking,’ or ‘curated’ in nature. Perhaps that’s the reason our work has been picked by the likes of Forbes, Foxnews, Gizmodo, TechCrunch, Engadget, The Verge, Macrumors, and more. Do take a tour of our website to get a feel of our work. And if you like what we do, stay connected with us on Twitter (@PiunikaWeb) and other social media channels to receive timely updates on stories we publish. I came from a mixed background of Statistics and Computer Science. My research domains included embedded computer systems, mobile computing and delay tolerant networks in post-disaster scenarios. Apart from tinkering with gadgets or building hackintosh, I like to hop on various subreddits and forums like MyDigitalLife and XDA.